Knowing the date of an archaeological site is one of the things that makes it most interesting – when were people here? Two main types of dating are applied to archaeological sites when possible– relative and absolute dating. Relative dating puts sites or artifacts “in order” by simply determining if one event happened before or after another. A common example of relative dating in Alberta is by using Mazama Ash. About 7600 years ago, Alberta was blanketed in ash after the Mazama volcanic eruption. This ash is still sometimes found today in stratigraphic profiles, buried under other deposits of sediment. When this ash is encountered it can be used as a time marker. Anything below it is older than 7600 years and anything found above it is younger than 7600 years. 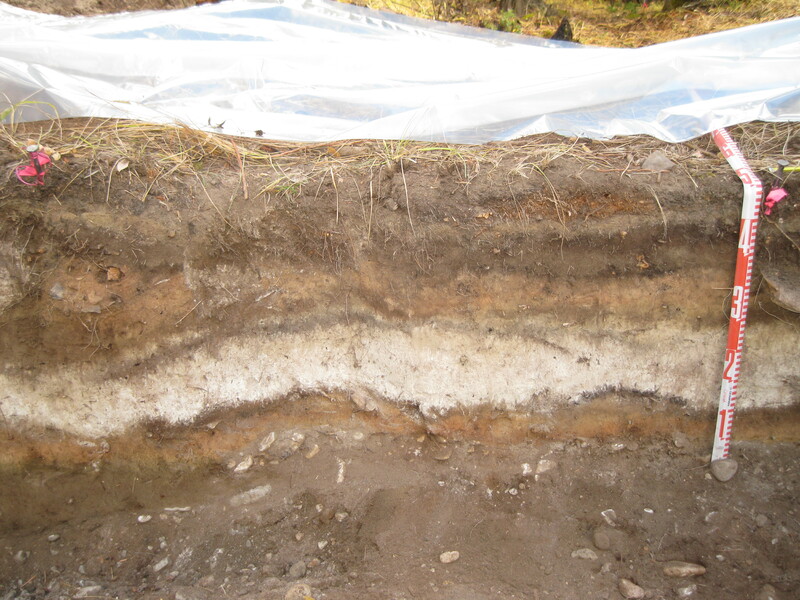 Example of a buried volcanic ash (also known as tephra) found during archaeological excavation. The ash is the lightest coloured layer in the profile, between 25 and 35 cm below the surface (between the 1 and 3 on the tape measure). Relative dates can also be obtained using artifact styles. Projectile points are one of the most common types of artifacts used to relatively date sites. Spearpoints represent the oldest projectile point technology and indicate that the site falls within the “Early Prehistoric Period” (11,200-7,500 calendar years before present), dartpoints are representative of the “Middle Prehistoric Period” (7,500-1,350 calendar years before present) and arrowpoints represent the emergence of the use of bow and arrow in the “Late Prehistoric Period” (1,350-250 calendar years before present). Dates can be further refined within each general time period based on the spear, dart or arrow style. This post was originally published on RETROactive on March 17th, 2015. We are once again approaching St. Patrick’s Day and we wanted to highlight this great post that talks about the history of the holiday in Alberta. Happy St. Patrick’s Day! Enjoy. This week’s post is part two of a series of infographics about the Archaeological Research Permit Management System at the Archaeological Survey of the Historic Resources Management Branch. 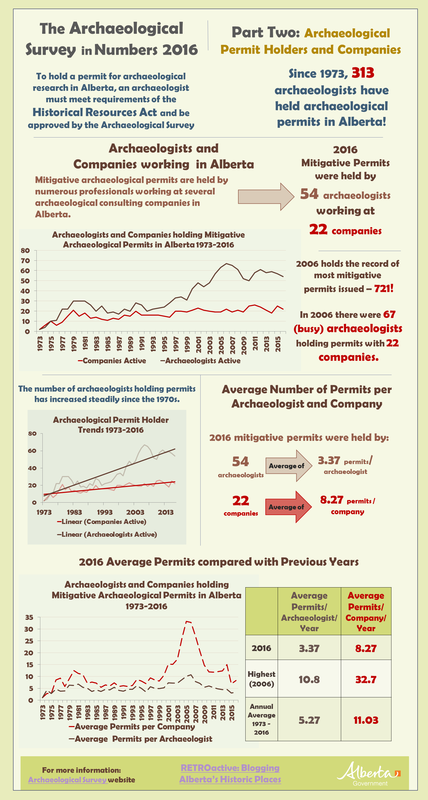 This infographic discusses the professional archaeologists and archaeological consulting companies working in Alberta. What Happened to Old Fort Edmonton? The afternoon of October 11th, 1915 saw removal operations commence. At the time, the buildings associated with Fort Edmonton V (the last incarnation of the fur-trading fort) were seen as an eye-sore next to the newly completed Legislature building and grounds. Newspapers of the day reported that the fort was taken down quickly as some citizens were outraged at its demolition. To quell the panic, the government assured the people that the old fort was being dismantled and would be moved to new quarters, repurposing the buildings as a museum. That never happened and the timbers associated with dismantled Fort Edmonton seemingly disappeared from the public eye. So, what really happened to the old fort? Stories about what happened to the timbers spread like local urban legends, most of them with no apparent basis in fact. There were rumours: that the timbers were reused in the construction of various structures and buildings in and around the Edmonton area; that the timbers sat for years in several piles both outside the Legislature and on the south side of the river; that beams were stored in the basement of the Legislature, before being used as firewood by an uninformed custodian; or that at least some of the historic timbers met their end in a nine-metre high Boy Scout bonfire lit May 12, 1937 to celebrate the coronation of King George VI. While some of these stories have some factual basis, others have not been fully confirmed or discounted. 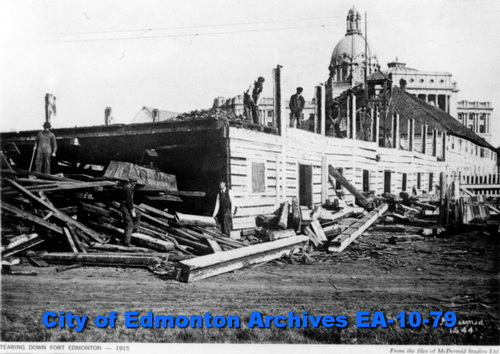 Demolition of Fort Edmonton (1915), City of Edmonton Archives EA-10-79.